Rose and walked Mix before showering and enjoying breakfast in the farmhouse. Mum, Rachel and I drove to Gavinton to attend morning service. Today was Epiphany Sunday (Epiphany itself is tomorrow) and Ann presented her final service in three parts (during Advent and the Christmas season every Sunday service has been in three sections). Her themes this morning were entitled ‘The dawning of a new day (or year)”, ‘the light of God’s justice’ and ‘the light of the new baby’. During her first meditation Ann read from the prophet Isaiah reminding us that he was the first prophet to look forward to God intervening personally in the story of the world – a prophecy which was eventually fulfilled in the person of Jesus, the light of the world. We too are called to be light to the world and are challenged today to reach out to others using our gifts to share in the ‘showing forth of who God is’ which is the meaning of this season of Epiphany. In her second thought Ann reminded us that there is a difference between power and justice. When we pray for our political leaders, our prayer is that they will use their power justly and for the benefit of those who stand in need of that justice. The Magi were non-Jews from a far country -- God's love is for everyone, our faith is a universal one. Finally Ann read a meditation on the Magi and their gifts – quite inappropriate gifts for a young child were it not that they pointed forward to all that he was: a king whose sacrificial death would destroy death itself. We sang Christmas carols for what I suspect will be the final time this season and the young student playing the organ, Valerie, played a lovely Irish folksong as the offering was being gathered. Following the service we went for coffee in the Church hall and then returned to Mount Pleasant. My first task was to collect some of the bits and pieces from the summerhouse in preparation for all that was planned for this week. Tom arrived and we fitted the skirting board and then, having visited Pearson’s to buy some more bits and bobs, we started to fit the main light. Meanwhile Rachel was fixing the final positions of the blinds and filling any small holes which remained. We were finally defeated by the dark with the wiring not completed. We’ll pick that up tomorrow when we also hope to take delivery of the carpet and the fixings for some of the windows. I’m excited already! In Church this morning, Ann spoke briefly about resolutions for the New Year. I have never made many resolutions, probably because I have always been too busy and I’ve known that I would be too busy all year. But this year is different. I have decided that during this year I would like to rediscover my Italian language. Once upon a time I was proficient, but that was many years ago. I thought I would like to attend a course in one of the Borders Colleges but I can’t find a course in Italian anywhere – Polish, French, Chinese, German and many others, but not Italian. I explored the idea of an internet course but I can’t really find anything I like. Rachel thinks that I should order a regular Italian magazine and read it from cover to cover. I’ll work on it and see what I can come up with. I have also resolved to learn to play my new ukulele with some degree of proficiency – that will take practice, so I’ll need to devote a bit of time each day to that. And I am going to learn my building skills. 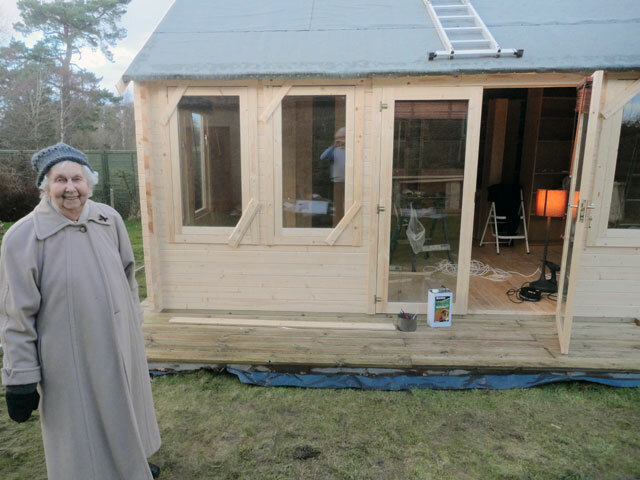 The summer house will soon be completed and then we shall move on to the Hen House which will involve real building skills. I’m collecting the tools, I’ve got Tom as my instructor and I’ll record my progress on these pages: retirement really is great fun! Rachel went off to the evening service at the Anglican Church in Berwick while I looked after the dogs and got things in order for tomorrow. On her return we dined in the farmhouse and then Olive and Mum joined us in the Granary for the second part of Death Comes to Pemberley. We all enjoyed it so much that we sat tight and watched the final part as well. It was a pleasant way to spend the first Sunday evening of a New Year. Unfortunately, I must also record that England lost the final Test match in Australia today and that even although Ben Stokes did well and Scott Borthwick didn’t do too badly for his first Test, the series has been a disaster for England. And all this just when I finally have time to watch the matches on television and spend time at the cricket down at Chester le Street. Ah well. We walked the dogs; by now there was snow blowing through the wind. I don’t expect that it will come to anything but we are certainly aware of the elements down here. I’m getting to bed early again tonight – tomorrow will be a big day.